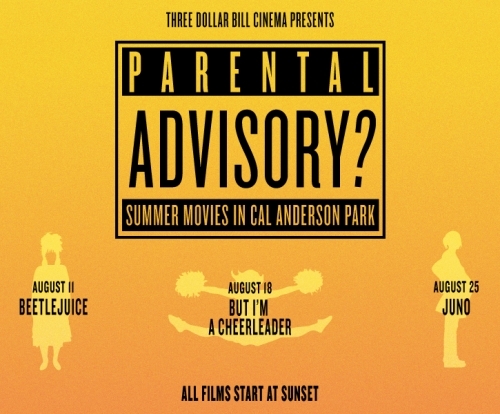 Three Dollar Bill Cinema returns to Capitol Hill's Cal Anderson Park with FREE outdoor movies! Your parents may warn you to not hang out with these unconventional misfits but see how much fun you'll have when you do! When parents say no, we say yes! Friday, August 11, at 8pm in Cal Anderson Park. What happens when freshly-minted ghosts (Gina Davis and Alec Baldwin) hire disgusting “bio-exorcist” Beetlejuice to scare off obnoxious new homeowners and their teen daughter (Winona Ryder)? Hilarity, tail-feather shaking, and total mayhem! Friday, August 18, at 8pm in Cal Anderson Park. A bubbly high school cheerleader (Natasha Lyonne) has her world turned upside-down when she is sent to an over-the-top boot camp because of her “lesbian tendencies.” With bad-to-the-bone queer crush (Clea DuVall), a “straight is great” coach played by RuPaul, and a lot of poorly repressed teen hormones at “True Directions” camp, the joke is on them! With a special performance by CHEER Seattle! Friday, August 25, at 8pm in Cal Anderson Park. When wisecracking sixteen-year-old Juno (Ellen Page) winds up pregnant by best friend Paulie she decides to give the baby to a couple she finds in the Pennysaver. But she gets way more than she bargained for in this indie just-be-your-weird-self dramedy. With a special performance by Kimya Dawson!